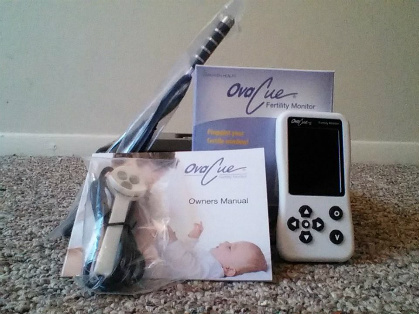 The OvaCue Fertility monitor from Fairhaven Health consists of a hand held monitor, an oral sensor, and a vaginal sensor (sold separately) that measure the electrolytes in your saliva and your cervical mucus. Out of all of the ovulation prediction methods that I have tried or looked into this one has been by far the easiest. Each morning when I wake up I place the oral sensor on my tongue for about 4 seconds and it takes its daily reading. Then around 5-7 in the evening I take my vaginal reading. I insert the vaginal senor until I fell it touch my cervix, then I pull it out about ¼ of an inch and press the button on the monitor to take my reading, in all it takes maybe 30 seconds to turn the monitor on, place the sensor, and take the reading. After the reading is complete I use warm water and a mild soap to clean the sensor and place it in the storage bag that came with the monitor. With the oral sensor it is very important that you take your reading as soon as you wake up, eating or drinking or even brushing your teeth can throw off your reading. The vaginal reading is much more lenient on timing, it recommends to do readings in the evening, but you can take it as long as you have been up and moving for 3 hours. I was slightly discouraged with how long it took for my fertile window to appear, but I believe that is because I am a very impatient person. I began using the monitor on cycle day 4 and my fertile window appeared on cycle day 9. I then ovulated on cycle day 13. The monitor was not only able to alert me to ovulation four days in advance, it was able to confirm my ovulation on cycle day 14 because of the readings from the vaginal monitor. When it comes to ovulation prediction, the OvaCue is definitely a 5 star product. Unlike other methods, this monitor can tell you up to week in advance when you will ovulate, which makes timing (the most important part in trying to conceive) almost a no brainer. My husband and I were able to look at my readings days in advance and make plans according to my fertility opposed to other methods where we only receive a 24-48 hour window of opportunity and can find ourselves scrambling to make time. The ovulation confirmation feature is absolutely amazing. It is one thing to take a urine test and know that there was a rise in a certain hormone level, but to see that little pink box pop up confirming that ovulation occurred is very reassuring. The color coded calendar on it makes interpreting your information easy. It clearly states “not fertile” “possible” Highly fertile” and “ovulation confirmed” on the screen with color coding. The only downfall I have found in this product is that if you have an irregular cycle, like myself, it can make it slightly difficult to pin point when to start using the monitor. Also if your reading have a sudden change you need to look at your actual reading instead of the color coding to figure out which data is correct. To counter act this downfall, Fairhaven Health has a wonderful support staff that walked me through every step of the process, answered any questions I had, and helped me figure out every detail. I would recommend this product to any woman that is trying to conceive in a heartbeat. Not only has it helped me to pin point my fertile days it has given me a better understanding of my bodies cycle. I will continue to use this monitor until I become pregnant, and I will also use it in the distant future if my husband and I decide to have more children. After using this product I will never go back to urine tests for ovulation prediction.